We would love you to have your wedding at our church; it helps if you have a connection with us (ie if you live, or have lived, in the parish*, or one of your parents do – or did, or if your parents or grandparents were married in our church) but please use the contact form below to have a talk about it. You can find out lots more about arranging a wedding at St Leonard’s from our thinking about getting married document (pdf format). If you’d like to know more about church weddings in general, the Church of England have a dedicated website. To find out more, please use the contact form below but please be aware that this is not sent using a secure method and is therefore not encrypted, so please do not enter any confidential information. The information you provide is only used for the purpose of replying to your email and dealing with your enquiry. For further details, please refer to our Privacy Notice. You can also e-mail = rector@stleonardslexden.org.uk with your name, email address and details and we will get back to you. Baptism (or Christening – they mean the same thing) is how you become a member of God’s family, the Church. 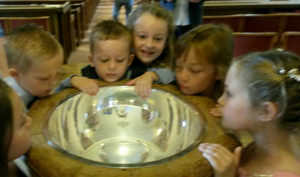 At St Leonard’s children are usually christened when they are quite young – but it can be done at any age and we have a few adult baptisms every year. Christenings are held on Sundays within a service or at a separate time. For you or your child, baptism marks the start of a journey of faith. Baptism is a ‘sacrament’ a visible sign of God’s love. In baptism, we are thanking God for his gift of life and publicly acknowledging his love for us; because of this we will baptise children of unmarried parents. We don’t set any barriers or conditions, other than you are willing to promise to teach your child about the faith into which they have been baptised. Of course, if you feel you need to find out more about Christianity in order to teach them – the best place to go is church! Come and see what it is all about – or go on one of our Alpha courses. Anyone who lives in our parish* is entitled to be baptised at our church. If you don’t live in the parish we can still hold the baptism, but we prefer you to have a connection with us (i.e. attend (or have attended) St Leonard’s, have been married or christened here, or a link through your parents). There is a useful website at www.cofe.anglican.org/lifeevents. This booklet Baptism Information (pdf format) will tell you more. *If you don’t know which parish you live in try the A Church Near You website. Put your postcode in to the parish finder and it will tell you. A Church of England funeral is available to everyone, giving support before, during and after the service, for as long as it’s needed. Although you will probably organise your loved one’s funeral with a funeral director there is some useful, practical advice from the Church of England. To find out more, please use the contact form below but please be aware that this is not sent using a secure method and is therefore not encrypted, so please do not enter any confidential information.The information you provide is only used for the purpose of replying to your email and dealing with your enquiry. For further details, please refer to our Privacy Notice.